The sixth edition of the FCBEscola International Tournament concluded Thursday with the presentation of the trophies to the winning teams in each of the four categories following the finals in the Miniestadi. It was yet another day of amazing friendship and bonding between the 1,500 players from 20 different countries and 33 different FCBEscolas and FCBCamps that have been competing since last Monday. 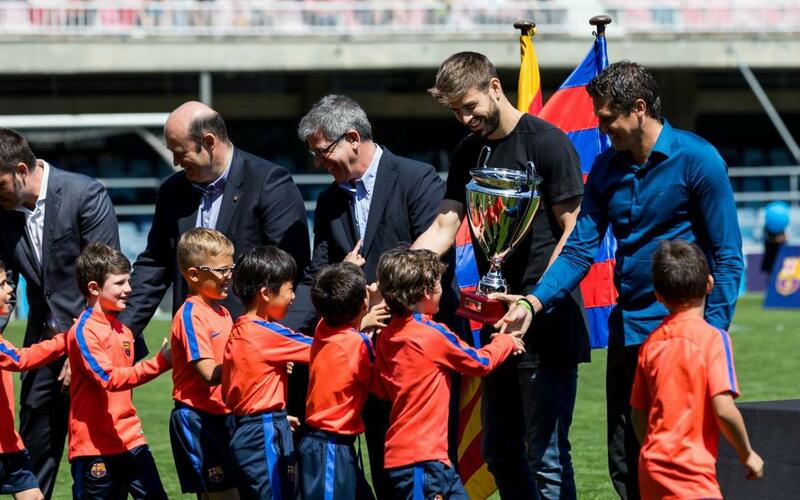 The presentation was overseen by Barça vice-president for sport Jordi Mestre; CEO Òscar Grau; former player and current ambassador for FCBEscola, José Edmílson; FCBEscola project director Franc Carbó and first team player Gerard Piqué. The trophies were dominated by the local FCBEscola Barcelona and two others from Brazil: FCBEscola Rio de Janeiro and FCBEscola Sao Paulo. The Initiation (U8) winners were FCBEscola Barcelona Blaugrana, who beat their fellow schoolmates from FCBEscola Barcelona Green in the final. In Formation (U10) there was another home winner in FCBEscola Barcelona Blaugrana, winning finalists against FCBCamps USA Red. The tournament set a new record of 457 games, which produced an unprecedented 1,755 goal, while special mention has to go to Carlos Uclés (FCBEscola Barcelona) for coaching his team to a third consecutive title. “It has been an incredible experience. To see 1,500 kids of 20 nationalities playing and behaving the way they did over these last few days makes us feel so proud of the good job we are doing at FCBEscola with all these projects. We could observe a fair reflection of the Barça methodology in all our teams and all we can do is congratulate out coaches for their excellent work all around the world”.